BBC Proms is holding the World’s first ever Relaxed Prom on Saturday 29 July 2017 at the Royal Albert Hall, featuring the BBC National Orchestra of Wales. The BBC Relaxed Prom (Prom 19) will be open to everyone, but the concert will be specifically designed to welcome families who will benefit from a more relaxed performance environment. This will be suitable for children and adults with autism, sensory and communication impairments and learning disabilities as well as individuals who are Deaf, hard of hearing, blind and partially sighted. In this live concert the full forces of the BBC National Orchestra of Wales bring you popular classics and music from TV and film for all the family to enjoy. 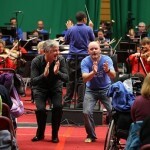 Presented by conductor Grant Llewellyn and musician Andy Pidcock, the Relaxed Prom is an interactive and fun experience of music in a welcoming environment. All tickets are just £6, plus booking fee. The Prom will be on wider public sale on 12 May. Until this date booking will be possible only via the link and promotional code(s) below.